Three meter high fences around your home, topped with electric wiring and crushed glass. Why does a nice upper class area like the Miraflores neighbourhood in Lima have to make their homes look like fortresses? A big part of the reason is revealed in a short drive to the poorer neighbourhoods of the city. Shambles and ruins that hardly look fit for a human habitation. Is the upper class in Miraflores afraid of being robbed by the desperate poor? A nice home in Miraflores with a well kept garden, surrounded by a tall sturdy metal fence, topped by a razor and electric wire. Welcome to my humble home indeed! Bad conscience and all does not seem to affect much change. The goverment in recent times has made a very modest raise in minimum wages but far short of what was really necessary for people to live decent life. So it had little affect on raising poor people’s living standards. What I saw with my own eyes around Lima is even far better than conditions in the countryside. No wonder people are generally very serious in Peru. Because, being poor in Peru is being POOR. One would think that there are enough riches in the country to distribute it more evenly to the masses. 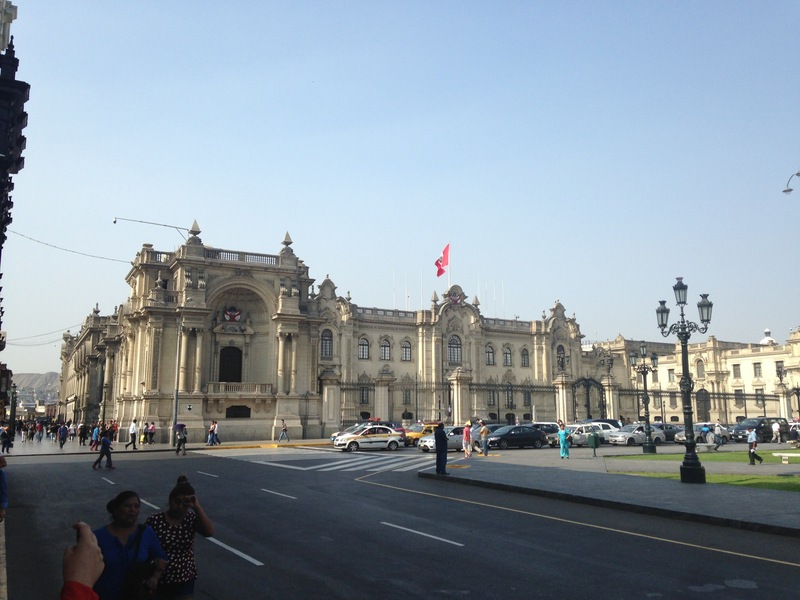 But the legacy of robbery of past ages is clearly still permeating Peruvian society. Why else would the poorer sections of their society be so desperately poor? Paying so low minimum wage, €233 or $253 per month, is a poverty trap that is almost impossible to escape from for those deemed to make a living on their poor salaries. While such low wages are a fact of life in Peru, then the better off have to live inside their fortresses. The better off seems however to be oblivious and complacant to the facts of life. Prejudiced against darker skinned people, that includes the Native American majority, they treat them like dirt. The minority white European descended people behave arrogantly like they are entitled to their position in society. They are determined to stop any development that benefits all of the citizens of Peru, or in other words, changes the status quo. The presidential palace. Just behind it one can glimpse the vast poor neighbourhoods of Lima. The way out is for the government to make an effort to remedy this situation. Better urban planning with cheap respectable homes, family friendly neighbourhoods and affordable loans with low interest rates. And most importantly, raise the minimum wage. People with more spending power is beneficial to society as a whole. Then finally, Peru can break free from the shackles of the colonialism and robbery that has hampered it’s progress to become a truly progressive society based on social justice and welfare for ALL it’s citizens.